To be frank, the entire concept of ice dam prevention is a little bit disingenuous. There are certain circumstances where even the most well constructed, well insulated and ventilated roof system will get ice dams. Those situations are rare, but they do occur. When we talk about ‘prevention’, what we are realistically discussing is the field of work aimed at either reducing the likelihood of ice dams or minimizing the impact of ice dams if they do occur. We break ice dam prevention into two broad categories; Architectural and Non-Architectural. Architectural solutions involve modifications to the existing structure to alter the problematic thermal characteristics that are contributing causes of ice dams. In contrast, Non-Architectural solutions are comprised of the work done to minimize the impact of unwanted roof and gutter ice accumulations when they are likely to begin. It’s seldom the case that a single home medication, once implemented, will permanently fix an ice dam problem. More often than not ice dam prevention involves a combination of changes in order to have a significant impact. A very standard ice dam prevention project for The Ice Dam Company might involve enhancing or replacing the insulation in the attic or roof system, adding ventilation and sealing all of the air-leaks between the heated spaces and the attic and roof framing. Usually, this combination of endeavors yields good results. Sometimes it is necessary to alter the roofing system itself. Normally, this means installing a single ply roof system such as hand-soldered copper pans or a rubber membrane. Single ply roof systems are quite resilient in the face of ice dams but they will to work in all areas due to aesthetics. We will dig further into each of the three basic architectural solutions in other Case Studies. Certain ice dam creation factors cannot be addressed through Architectural solutions such as insulation, ventilation, air-sealing or roof system enhancements. Case Study #19 discusses the relationship between the sun and ice dams. We recently installed heat tape on a 6 year old, $3.8 million dollar home. The homeowner had spared no expense relative to energy efficiency in the original design and construction. That was not the issue. The problem was simply that the sun was melting the snow on an exposed roof plane higher on the home which resulted in melt water running down to a cold eave area that was hidden from the sun. There it would re-freeze in cycles to create an ice dam that kept coming back year after year. In terms of ice dam prevention, there is a small set of options available that fall outside of the Architectural solutions. These involve systems to manage snow and ice accumulations as they develop on a roof. The most popular Non-Architectural ice dam solution is heat cables. Otherwise known as heat tape and roof deicing, heat cables are wires that warm up in response to electrical current. Typically, heat cables are installed in a serpentine or zig-zag pattern on a roof along the eaves. To be clear, heat cables do not resolve the underlying issues related to why ice dams are happening rather they help manage the issue of unwanted ice accumulations when the conditions are ripe for their formation. A common complaint about heat tape is that it does not address the real issues causing the ice dams. This complaint is justified because it is true. That said, heat cable systems can be installed on a home for a fraction of the cost of traditional Architectural solutions. Many homeowners are not in the position to spend $5,000 to $25,000 for Architectural ice dam solutions making the idea of a $1,000 heat cable system very appealing. We do both approaches every day. We would be remiss in not mentioning the very most basic thing you can do to minimize the likelihood of ice dams; Roof shoveling. Diligently removing the snow from your roof can greatly reduce the likelihood of ice dams. Unfortunately, some roofs are too high or have areas inaccessible to the average homeowner, making roof snow removal an ineffective approach to guaranteed ice dam prevention. Removing all of the snow from the roof planes affected by the ice dams is very important. 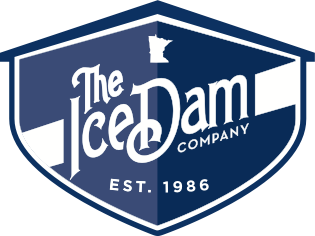 See the Ice Dam Company Case Study #3 that discusses a phenomenon called the ‘Double Dam’. This entry was posted on Tuesday, February 7th, 2017 at 3:22 pm and is filed under Ice Dam Heat Tape, Ice Dam Prevention, Ice Dam Removal, Ice Dams, Misc., Ice Dams: General Info. You can follow any responses to this entry through the RSS 2.0 feed. Both comments and pings are currently closed.